The following article by Commissioner Meera Joshi includes information intended for the January 2018 issue of TLC Magazine but was not received in time for publication. The TLC wishes you and your family a safe and healthy New Year, and hope that you had a joyful holiday season. We are happy to share the latest updates from the TLC with you. In December, the Taxi and Limousine Commission Board voted to approve the proposed accessibility requirements in the For-Hire Vehicle industry. This follows a long standing lack of accessible service in this quickly growing sector. The requirements begin with bases dispatching 5% of all trips in 2018 to wheelchair-accessible vehicles, scaling up to 25% in 2022. This will put wheelchair-accessible vehicles into active circulation where they can be on the road and ready for passengers who need them. Bases also have the flexibility to dispatch to any wheelchair-accessible vehicle, including green taxis, in areas where they are permitted to accept dispatches. The Commission also approved a pilot which will allow any base to use a central dispatcher to provide accessible vehicles. Those bases who choose to join the pilot will not need to comply with the trip mandate rule. For more information on how to join the pilot, please contact Deputy General Counsel Ryan Wantajja at 212.676.1055. The TLC is confident that under either approach, those passengers who need wheelchair-accessible vehicles will get them, and would like to recognize the industry for their continued support to make this a reality. The TLC Commission also approved a pilot that will test the use of connected vehicle technology in taxicabs as part of the participation of our sister agency, the Department of Transportation, in a larger pilot by the United States Department of Transportation. This technology can make our streets safer with safety applications that include in-vehicle warnings about blind spots. It can also give an alarm if a driver is approaching a curve. 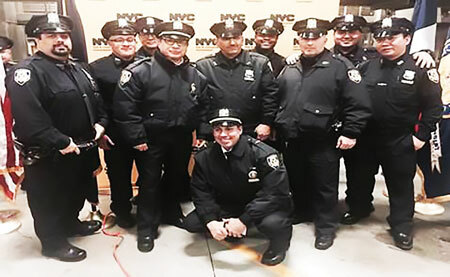 The TLC’s Squad 12 was recognized for their outstanding work in enforcement of Vision Zero violations. The TLC’s Uniformed Services Bureau, under the leadership of Chief Dianna Pennetti, plays an important role in protecting the livelihoods of TLC licensees who follow TLC rules and work hard to safely take New Yorkers from work, home, and leisure. The work of TLC officers is also important in promoting public safety and protecting the safety of consumers who use TLC-licensed services. Last month, we honored some of the bureau’s many achievements with a Shield Day and Award Ceremony. Medals were given to our officers for merit, service, and advancing Vision Zero, the city’s efforts to make our streets safer and prevent traffic fatalities. We are grateful for their hard work and service in fighting illegal activity. They protect businesses that do the right thing and which are vigilant about following the TLC’s rules. We were so happy to learn on New Year’s Day that the first baby born in New York City in 2018 is the daughter of a cab driver. Kazi Ariana Shirin came into the world at 12:01 a.m. in the Flushing Hospital Medical Center following 36 hours of labor, according to a report in the Daily News. Her father, Imran Nazir, is a taxi driver who lives in Jamaica, Queen, and is originally from Bangladesh. �I am so excited for our new year baby,� said the mother, Tania Shirin, to the Daily News. We wish this beautiful family a very joyful 2018. We congratulate them on this happy new chapter in their lives. Accessible Dispatch has been an important service for many New Yorkers, as well as visitors to our City, since it first launched in 2012. The program connects passengers with wheelchair-accessible taxicabs when they place a request via a phone call to 311 or to 646.599.9999, the Accessible Dispatch app, or at the website www.accessibledispatch.org. At the time of writing this column, we anticipate having announced in January the full launch of our citywide Accessible Dispatch Program, following its beta launch in the fall. Whether you need a taxi in Dongan Hills, Kew Gardens, Mott Haven, or Hell’s Kitchen, you can request a wheelchair-accessible cab with the method that is most convenient for you. If you drive a wheelchair-accessible taxi, you can also make more money by enrolling in the program. You will receive the standard metered fare and an additional dispatch payment for traveling to take an Accessible Dispatch trip. This is separate from any money you receive through the Taxi Improvement Fund. I also want to note the significant rise in the number of wheelchair-accessible yellow and green taxis on the road, and thank the industry for their hard work in making our city more equitable. The number of yellow wheelchair-accessible taxis has grown from 231 in 2013 to more than 2000 on the road now. There are also more than 250 wheelchair-accessible green taxis on the road as well. The significant growth in accessible taxicabs play a crucial role in making our Accessible Dispatch program successful, especially in serving New Yorkers at a city wide level. Last month, the City Council announced its leadership assignments for the next four year term. Congratulations to Council Member Ydanis Rodriguez for chairing the Committee on Transportation, and Council Member Reverend Ruben Diaz, Sr. for chairing the Committee on For-Hire Vehicles. We look forward to working with you both. As always, we look forward to hearing your input and seeing you there.